holy are you in giving life to forms. earth wears her green vigor. Join a community of pilgrims in Germany as we experience the landscapes and rhythms that nourished Hildegard of Bingen, mystic, composer, artist, poet, healer, preacher, ecological visionary, and spiritual director. Let Hildegard become a soul guide as you immerse yourself in viriditas, the greening power of God, and embrace the legacy of her creative outpourings as gifts for our time. Through presentations, contemplative practices in sacred spaces, community, and creative forms (including movement, music, writing, and visual art) Christine and Betsey will guide you in exploring how the paths of the monk and artist, which Hildegard so firmly embraced, can become doorways to our own soul’s deepening and the greening power of the Divine Presence in our lives. subject to modifications and inspirations as needed due to weather, etc. Arrival and Orientation: We begin with retreat welcome and introductions. An evening orientation and session on pilgrimage invites you to intentionally begin with a slowed pace to help you arrive and ground in this beautiful setting and experience the landscape that nourished Hildegard’s life. Retreat Day: On our first “retreat” day at the hotel, we will gather in community to set into motion our monastic rhythm for creative and contemplative explorations inspired by themes from Hildegard’s life. We will explore Hildegard’s keen insights into the greening power of God. Through art and prayer practices we will tend together the juicy gifts of viriditas, the creative life-giving force at the heart of everything alive, and at the heart of Hildegard’s soul and work. As the pilgrimage continues, we will keep this rhythm of art and prayer on each of our “retreat” days, exploring practices such as lectio divina (which originates in the Benedictine tradition), movement, chant and song, mandala-making, photography, and writing. There will be free time in the afternoon to walk and explore. Disibodenberg: We will go out by private bus to visit Sponheim Church and labyrinth in the morning, which is the birthplace of Jutta, Hildegard's mentor. In the afternoon we make the pilgrimage to Disibodenberg, the former Benedictine monastery where Hildegard first entered monastic life and spent much of the first half of her life. The site is now an ancient ruin, but the sacredness of this place is still palpable. We will hear stories of Hildegard’s early life, explore the ruins and share a contemplative prayer ritual around the altar there. Retreat Day: Hildegard embraced the positive role of the body and the senses in the spiritual life as the doorway to encountering God in the world. Rooted in her Benedictine life, she saw moderation and balance as the heart of thriving physically and spiritually. Enjoy the “liturgy of the hours” of prayer and art, as well as the balance of hiking in the nearby nature preserve, and learn about Hildegard’s herbal healing practices. Rupertsberg, Eibingen, and Abbey of St. Hildegard: Around the year 1147, Hildegard left Disibodenberg with about twenty of her fellow sisters to found her own monastery, Rupertsberg Abbey, in the town of Bingen on the Rhine River. In the morning, we will tour the Rupertsberg ruins and engage in a ritual in that space. In the afternoon we will cross the river by ferry to visit the current Abbey of St. Hildegard in Eibingen and the parish church where the holy shrine with Hildegard’s relics is kept. Retreat Day: Wisdom, or Sapientia, was a key figure in Hildegard’s visions and theology as were the virtues, which she named as the gifts given to us to cultivate our inner greenness. Always appearing as feminine presences, we will explore what Wisdom and the Virtues can offer to us for living in a complex world. We will spend time breaking open Hildegard’s Ordo Virtutum, (one of the first-ever Morality Plays) and share a creative reading/enactment of her drama. Kaiserpfalz in Ingelheim and Kloster Eberbach: We will travel by bus to the ruins at Kaiserpfalz in Ingelheim, one of the few places Hildegard would have visited still existing. 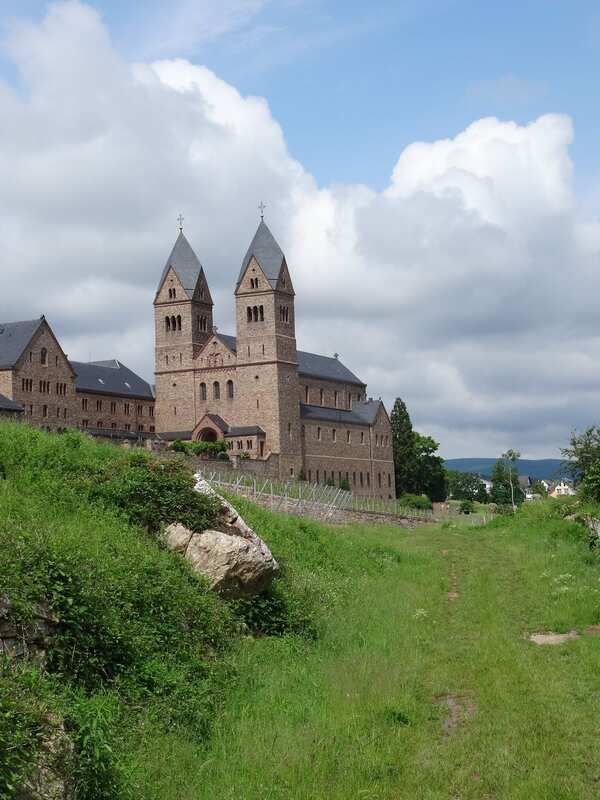 In the afternoon we will visit the beautiful Cistercian Abbey Kloster Eberbach, founded during Hildegard's lifetime and where they filmed many scenes for the Hildegard movie “Vision”). We will also see parts of the beautiful medieval Middle-Rhine-Valley. Retreat Day: A day where you are invited to tend to the inner rhythms of your heart and nourish yourself with the gift of Sabbath rest, time spent in silence and solitude, and an opportunity for reflection and integration of what we have experienced so far. We begin and end the day with a group reflection and ritual. To celebrate her Feast Day we will join in celebration with Hildegard's present-day community of sisters and the town of Rudesheim and Eibingen where a procession with her relics through the street is held. We will participate in a special Vespers service at the Abbey. Retreat Day: For Hildegard, the incarnation could be said to be more important than salvation. Her theology and practice opens us up to a profound honoring of the sacred present in all creation. Mary and the divine feminine play a central role in being the bearer of this holiness into the world. 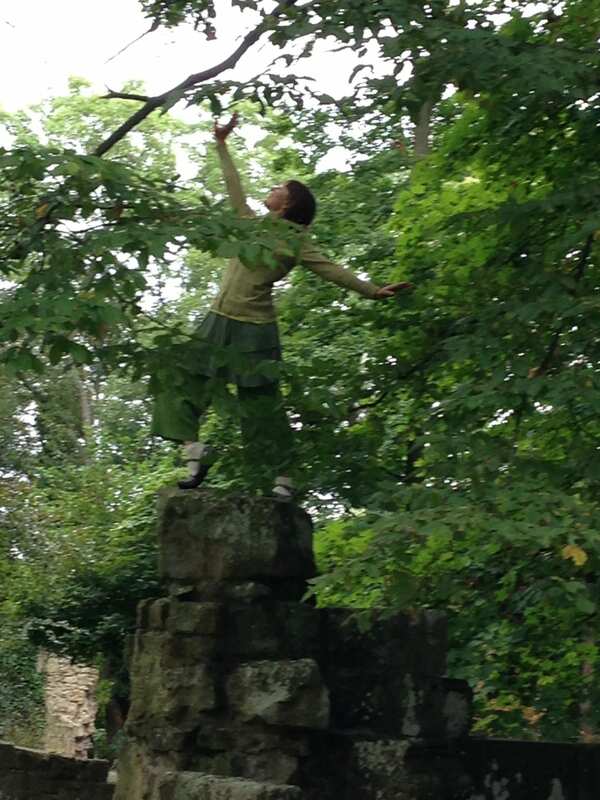 Through the arts we will also reflect on our experience of the whole pilgrimage and how we might bring the gift of Hildegard's greening power back to our everyday lives and communities. Our day will close with a final ritual to celebrate and integrate our time together. We want your pilgrimage experience to be soulfully enriching, stretching and challenging in the best ways, radically hospitable, inspiring, and wildly supportive of where you are. If you're not sure if this program is right for you or your fit with Abbey of the Arts please be sure to review everything here carefully, read more about the Abbey, about Christine and John, about the Holy Disorder of Dancing Monks, sign up for our free Monk in the World online course, read one of Christine's books, and if you feel a YES rising up within we eagerly welcome you to join us! When you register you are making a commitment both to yourself as well as to us and the community that forms. We limit participants to a small intimate group, so dropping out affects the group experience and us as small business owners. We know sometimes life intervenes and cancellations happen. Please be clear on our cancellation policy. But also please be clear on your commitment to this experience. There are no refunds after these dates and no exceptions. (Your independently purchased travel insurance will protect you in the event of emergency situations.) To pay by check or if you would prefer to pay in USD$ or by bank transfer please contact us for details. 1. Please read through this entire page including Policies and FAQs (below) and contact Christine with any questions or concerns. 2. Go to the Hildegard Pilgrimage Registration page, fill out the requested details and submit payment for your deposit. 3. Sign the Terms and Conditions – Hildegard Pilgrimage 2018 (click the link to preview them, you will be asked to sign them electronically once your deposit and registration form are completed.) Paying your deposit implies consent to these and all the information on this page. 4. Purchase travel insurance to include trip cancellation (“cancel for any reason” highly recommended), as well as repatriation of remains, medical, and loss of property. We recommend purchasing as soon as you make the deposit. While we can't make recommendations for specific travel insurance providers, this website can be helpful in comparing different options. The coverage is here to give peace of mind as you invest your finances in this grand adventure! You will need a passport to travel to Germany. U.S. citizens can visit for up to 3 months on an automatic travel visa. EU citizens can enter visa-free. You are responsible for checking with your local German embassy for requirements. This pilgrimage will require some hiking and walking over rough ground. You should be able to walk 2-3 miles comfortably over uneven terrain and be able to climb stairs and over things. The hike to Disibodenberg does involve some elevation gain. Pack sturdy waterproof shoes/hiking boots and clothing suitable for both cool and warm temperatures, and rainy weather. Where is the Hildegard Forum Hotel located? You will be staying on the Rochusberg (hill) in the town of Bingen. There is a public bus that will take you into town or you can choose an easy 20 minute walk. The Abbey of St. Hildegard is across the Rhine river (a picturesque view from our hotel) and reachable by ferry. Bring layers to wear. Germany can be often rainy and cool, but the weather can also get quite warm in summer and early autumn. Best to check the extended forecast before leaving. Your meal includes a main course/entree. We ask you to indicate your food needs on the registration form. Servings are generally pretty hearty. Beverages, appetizers, and desserts are an additional cost. You can pay by credit card right from this web page using the buttons above. We also accept checks (we will send you our U.S. or Irish mailing address depending on where you are sending payment from) and payment by bank transfer (we will send the details of our account on request). If you would prefer to pay the amount in USD$, please let me know and we will send you the exchange amount. What happens if I have to cancel my participation? The €500 deposit is an administrative fee that secures your space in this small pilgrimage and is nonrefundable. There are no exceptions to the refund policy.The balance of the program fee is due by the dates mentioned above and is nonrefundable after that time. As mentioned above, we require that you obtain travel insurance to cover financial losses from any personal emergencies or other events which require your cancellation. For the best coverage, we highly recommended you purchase insurance at the time of making your deposit (often preexisting conditions are only covered if insurance is purchased within a few days of making the first trip payment). You are responsible for reading your policy and understanding what it covers. What happens if the organizers have to cancel the pilgrimage? In the unlikely event that we either do not have enough participants registered four months prior (by the final payment due date) or if there is an emergency which prevents Christine and/or Betsey from leading the experience, all of your pilgrimage fees paid will be refunded or we will offer you a space on a future pilgrimage (your choice). However, we are not responsible for any other losses, including your travel expenses which you may incur due to this cancellation. This is one of the practical reasons we require that you obtain travel insurance at the time of your booking confirmation to cover this possibility. If you are traveling with a friend or partner, or you would like to be paired with a roommate, you can share a double room for a reduced program fee. Please be advised that if we are unable to find a roommate for you, you will be liable for the single room fee. Once you say yes, the pilgrimage has already begun! Pay attention to the dreams of your waking and sleeping life in the coming months to see what is being stirred. Christine and Betsey will be sending some suggested reading and reflection. What is the best way to get to Bingen? You will want to fly into the Frankfurt main airport (code: FRA) and from there you can catch a train to Bingen which departs about every half hour and takes about an hour to an hour and a half travel time (depending on whether you board a direct train or one that requires a change in Mainz). In Bingen you will want to hire a taxi up to our hotel. More specific directions will be sent in April 2018 along with a reminder of the final payment due date. Travel to Bingen is not included in your pilgrimage fee. Christine Valters Paintner, PhD, REACE is the online abbess of Abbey of the Arts, a global community serving thousands of monks, artists, and mystics who are hungry to integrate contemplative practice and creative expression. Christine is also the author of eleven nonfiction books on monastic spirituality and creativity, as well as a poet who has been published in several journals. She has lived on the wild west coast of Ireland for the last five years, falling always more in love with the place. Her latest book The Soul's Slow Ripening: 12 Celtic Practices for Seekers of the Sacred was published by Ave Maria Press in fall 2018. You can find out more about Christine here or see more of the books she has written here. Betsey Beckman, MM, is nationally acclaimed as a spirited dancer, storyteller, teacher of SpiritPlay and dancing Spiritual Director. 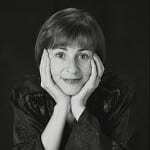 With her extensive repertory of sacred storydances, she is regularly featured as artist/presenter at national conventions as well as local churches. She earned her Masters in Ministry degree from Seattle University, her certificate in Movement Therapy from the Institute for Transformational Movement, and is a certified InterPlay leader. As dancer, choreographer, author, mother, wife, teacher and spiritual director, she is passionate about living life fully and fostering creativity in all those with whom she shares life and ministry. 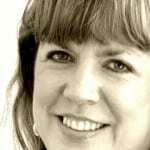 Betsey’s publications include books, recordings, and The Dancing Word series of DVDs on embodied prayer. She offers the gift of playful improvisation whenever possible! Find out more about her work at her website: The Dancing Word.